TambelanBlog :: Firefox 3 2008 Release, Ready to Start ? Guinness World Record "Most downloaded software in 24 hours"
Firefox 3 2008 Release, Ready to Start ? Guinness World Record "Most downloaded software in 24 hours"
Firefox 3 2008 Release The Download Day "Most downloaded software in 24 hours"
To all Firefox Loyals (including myself), web people and designers, the long awaited browser is finally out - it was launched 3 days ago (17 June 2008). It's so cool that it has been called "The Best Firefox Yet". It is the incredible and ultimate Firefox 3. I was to download it immediately. According to Mozilla (it's developer company), Firefox 3 has up to 15,000 improvements, which happens to be much faster, safer and smarter than ever before. I don't even know more than 25 of their improvements and they've already claimed that much. The browser is so futurama, that it has it's own launching gimmick called "The Download Day". The objective is to set a Guinness World Record for the "Most downloaded software in 24 hours". On June 18, 2008 8,002,530 people downloaded Firefox 3 and are now enjoying a safer, smarter and better Web. It now has more than 14,190,000 downloads worldwide. Isn't that unbelievable? In just 3 days. Bravo! Check out the live stats which are broken down into countries by clicking here. Enough talk about the promotion, let's move on to the features of Firefox. 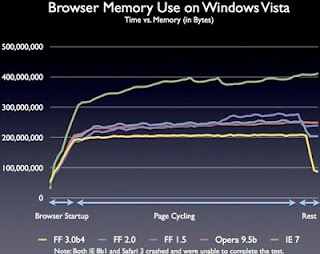 So, what are the anticipated things on the latest Firefox 3? Well, we all know browsers have this Address Bar, but Firefox 3 modified theirs into something called the "Awesome Bar". This bar allows users to use the URL field to do a keyword search of your history and bookmark. As shown in the image above, you no longer need to type in the URL address, instead the Awesome Bar matches exactly what you're typing (even multiple words). Searches from URLs, to page titles and tags from your bookmarks and history. 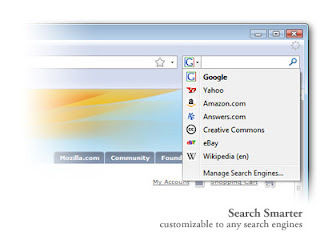 Then the smart Search Box located on the top right side of the browser. Now it not only has Google as it's search engine. It has wonderful others like Wikipedia, eBay, Answers.com and more. Now, you can even customize and manage the list with your own favourite search engines too. The star icon alongside the location bar is actually the shortcut click to bookmark your favourite websites. Now it's all down to a single click on the icon. No more bookmarking your site by click on the top bar and hassle anymore. For users who require magnifying capabilities. 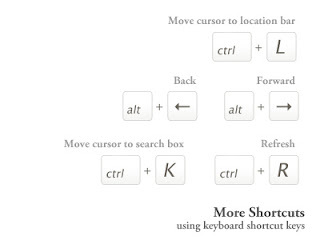 Here's some shortcut keys similar to our everyday software of Photoshop and Illustrator. 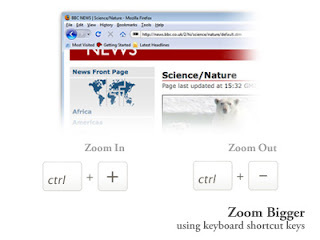 Which is "Ctrl +" to zoom in and "Ctrl -" to zoom out. It's recommended when doing lectures or presentations on a projector screen. The famous tabbing system in modern browsers are a hit in Firefoxes too. Now it has a new function to reopen a closed tab. Last time we got annoyed when accidentally closing a tab, now we can recover it with just a shortcut key away. Clever bastards. 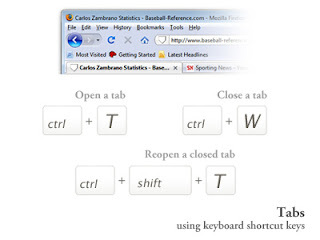 Apart from those, other shortcut keys are available on the Firefox too. Some new and some old, but all still as useful as before. 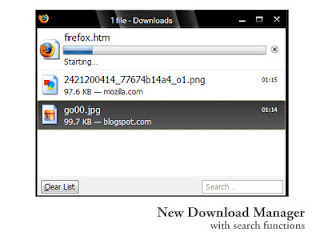 The new download manager now allows users to pause a download and resume it later, with a search box to easily retrieve previous downloads too. Hmm...*tempting tempting. The famous add-ons for Firefox still exists and now thanks to many third party developers, add-ons are getting more and more effective and convenient for various users. Now everyone can customize their own Firefox and show off their add-ons to... erm..whoever lah. So, get your copy of Firefox today. It's fun, it's cool and it's the best yet! To all Malaysians: "It's free lah... No need find crack one! Go Go Download". You may click on the little icon above to download Firefox 3.